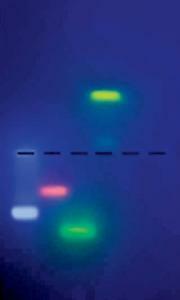 Solve the mystery of invisible bands, and bring the excitement of fluorescence to your electrophoresis lab with this innovative experiment. Ideal for introductory DNA electrophoresis lessons, this hands-on kit includes Ready-to-Load™ dye samples, agarose powder, practice gel loading solution, electrophoresis buffer, microtipped transfer pipettes, and detailed instructions. Requires electrophoresis apparatus, power supply, and UV light source, not included. Materials supplied for ten student groups. Time requirements: 45 minutes.